Google‘s long awaited web-based PowerPoint-like application finally went live this morning. 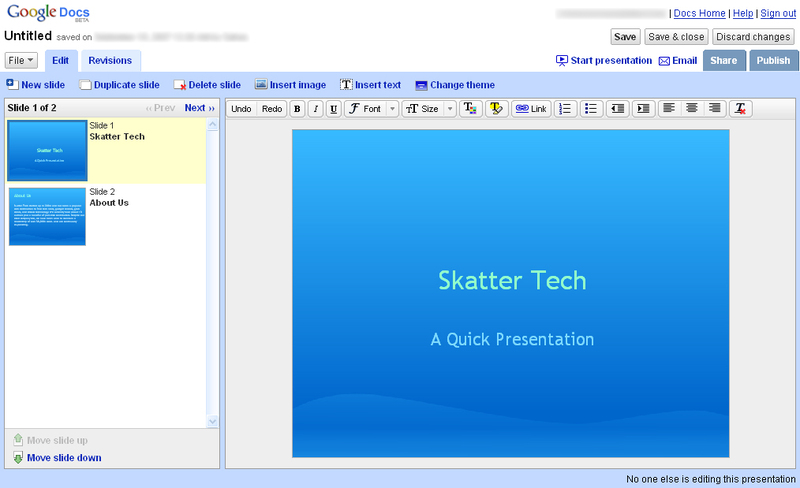 Google Presentation, as it is called, is their latest addition to the Google Docs family. Starting today, anyone in the United States will have the ability to upload, create, share, edit and view presentations online. Google Presentation also includes collaborative tools allowing multiple users to connect together to organize, modify, and present right from a web browser. Since Google Docs’s presentation feature supports Microsoft’s PowerPoint, any document created offline can easily be uploaded. Unfortunately documents created or edited online can only be exported into a HTML format, therefore won’t work with PowerPoint. This is a pretty big step towards completing an entirely free online version of standard office applications. With Gmail and Google Docs for spreadsheets, word documents, and presentations, they may soon pose a serious threat to Microsoft Office. Although literally all their services are still in beta and are very limited in terms of features when compared to any standard office suite. For example Google Presentation only has 15 themes, basic text formating, limited image modification, no transitions, no sound/video, and lacks much more. This will most likely change as updates are rolled out. Anyways give this a shot, but if you are still planning on purchasing MS Office keep in mind that Microsoft’s got that $60 deal! If you’d like to avoid that fee too try the new version (v2.3) of OpenOffice. awesome, screw ms office. im so glad ifound out about open office. with both this and oo, i’ve got just about everything ill ever need. plus i could always just bittorrent ms office if i really needed it. Now it will be interesting to wait and see how far Google Docs will be able influence the MS Office users. IBM also announced their free version of Office today, it only includes support for .doc, .xls, and .ppt but this is more than enough for average users. I actually haven’t tried it yet so still can’t say how it compares to Google’s online office.